Swan Point Landing Fly Shop in Rockport enters its eighth year on the Middle Texas Coast as a constantly fluid mix of the saltwater fly fishing industry’s best tackle, clothing, and gifts supported by a seasoned, common sense staff. Mix in an excellent fly fishing guide service, the best selection of fly tying materials in the South, great coastal clothing lines, and easy access to a cold drink and you’ll find one of the best places to spend a little off-water time in Rockport! Test drive the newest and latest graphite from Sage, Orvis, TFO, and Hardy on nearby Little Bay! 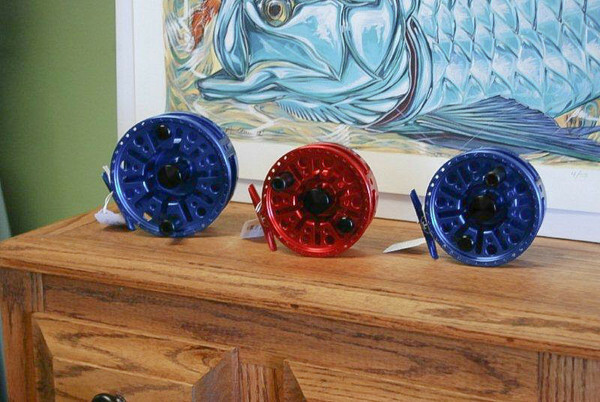 Pair them with the best in machined reels from Tibor, Hatch, Orvis, and Lamson! Swan Point Landing offers a large selection of luggage, packs, and technical clothing from Patagonia, Simms, Fishpond, and Orvis along with a handful of product lines to enhance your time on the flats! We do special orders from all our suppliers and standard shipping is always FREE! There is a social meeting each Friday evening at the shop, starting at 5:30 with a fly fishing program at 6:15 sharp. Call the shop for Details 361-729-7926.